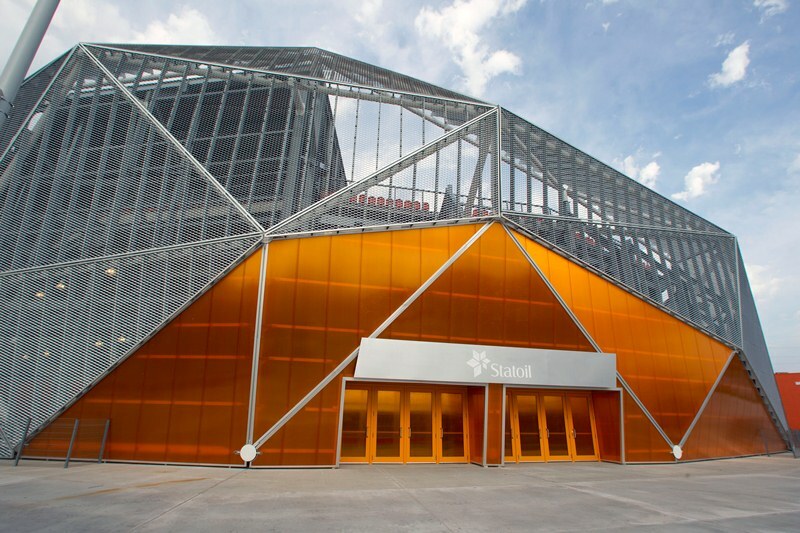 The new BBVA Compass Stadium in Houston is the first US stadium to utilize polycarbonate (PC) LEXAN THERMOCLICK sheet product for its enclosed entrance façade, according to SABIC’s Innovative Plastics. For the 22,000-seat BBVA Compass stadium, which opened on May 12, 2012, the architectural firm Populus designed an exterior surface composed of geometrically expanded metal mesh and orange LEXAN THERMOCLICK sheet cladding. AmeriLux International LLC, SABIC’s authorized distributor in the US and the country’s exclusive distributor of 50mm LEXAN THERMOCLICK sheet, provided the 1,000mm wide panels used in the façade system which was designed and engineered by Duo-Gard Industries, Inc.
“We are very pleased to announce the latest expansion in the use of LEXAN sheet products, which have been chosen to create large and dramatic architectural glazing, roofing and façades in stadiums and arenas around the world,” said Sandeep Dhawan, General Manager Americas, Specialty Film & Sheet, Innovative Plastics. LEXAN THERMOCLICK sheet system in 50mm thickness provides high impact resistance of LEXAN resin for safety, ultraviolet (UV) protection on the outer surface for weatherability, and good light transmission for a pleasant ambiance, emphasizes SABIC. This solution offers a good U-value of 0.176 Btu/h t2 Fahrenheit (1.0W/m2 K) for thermal insulation, leading to energy savings by reducing power consumption up to 17% against traditional high-return, double-pane glass glazing. With a specially designed V-joint connection profile, including a groove and smart snap design on both sides, LEXAN THERMOCLICK sheet’s interconnecting configuration eliminates the need for vertical profiles, thereby reducing costs and enhancing aesthetics, says the company. Also, this new tongue-and-groove connection design provides high stiffness and low horizontal purling at larger spans. In addition, the orange color helps displaying the unique style of the new urban stadium, which reflects the industrial heritage of its East Downtown location and its MLS team, Houston Dynamo.